October 5, 2011 - CyberSource, a Visa company, announced that Turkish Airlines will use CyberSource solutions to assist in its fight against online fraud. The award-winning airline has selected Decision Manager, CyberSource’s global fraud management portal, and Performance Monitoring, a CyberSource managed risk service providing fraud process analysis, monitoring and tuning from skilled experts. The Istanbul-based carrier was recently named “fastest-growing” among the world’s top 25 airlines by the Centre for Asia Pacific Aviation. 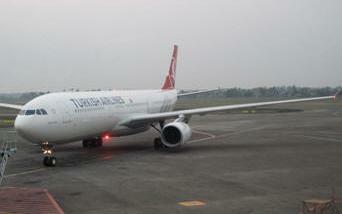 Turkish Airlines was also named “Best Airline in Europe” at the 2011 World Airline Awards. Turkish Airlines’ fraud management team will use CyberSource’s Decision Manager to access over 200 global validation tests and services through a sophisticated but easy-to-use rules console. According to rules set by Turkish Airlines, Decision Manager will assess incoming transactions for fraud and return a recommendation to accept, reject or mark the booking for further review. The automated screening takes about two seconds and helps streamline Turkish Airlines’ fraud decision process, freeing up its manual review team to investigate the more suspicious bookings. Via the accompanying Performance Monitoring service, Turkish Airlines’ staff will receive active support from skilled CyberSource fraud analysts. CyberSource experts will conduct a complete analysis of Turkish Airlines’ transaction history and business processes, ensure installation of a fully tailored solution, and provide ongoing monitoring and tuning to further enhance business results.